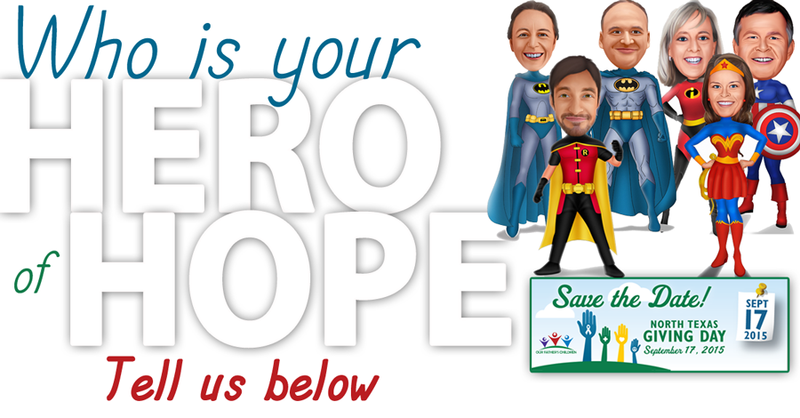 As we get closer to Sept 17th and participate for the first time in the North Texas Giving Day​, we want to ask you a question: WHO IS YOUR HERO OF HOPE? Think about that fellow counselor at camp. Or maybe it’s the selfless actions of a volunteer at Onward & Upward. Maybe an Aunt or Uncle who did that “something extra” for a kid at Royal Family this past summer. Who is your HERO OF HOPE? We’d like you to tell us so we can post about it. We know we all aren’t superheros with special skills and magical capes. It takes ordinary men and women to offer hope to these children of abuse and neglect. So … who is your HERO OF HOPE?